The Tower at Dubai Creek Harbour, which when completed will be 100 metres taller than Burj Khalifa, is all set to rise. 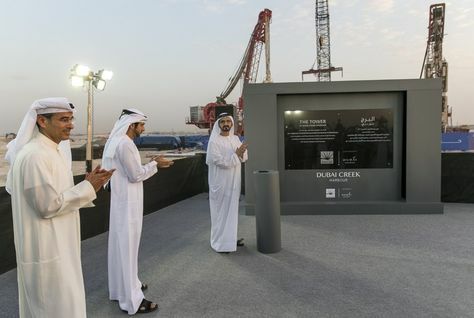 Emaar Properties, the developer of Dubai Creek Harbour, a joint venture with Dubai Holding, on Monday announced the completion of the pile foundations. It said in a statement that in the coming days, the first structural facets of The Tower will be visible with several dedicated teams already on-site to accelerate the development. Emaar added that it has set a new world-first with the foundation work for The Tower at Dubai Creek Harbour. The pile was tested to a load of over 36,000 tonnes – the maximum carried by a single foundation pile to date – and a statement on its strength and durability. More than 145 barrette piles have been used to form the foundation for The Tower at Dubai Creek Harbour, designed by Spanish-Swiss architect Santiago Calatrava Valls. The Tower is centred off the Dubai Creek, not too far from the Ras Al Khor National Wildlife Sanctuary, protected under the UNESCO Ramsar Convention and home to over 67 species of water birds. It is expected to be completed for the Dubai Expo trade fair in 2020, the same year that the Kingdom Tower in Jeddah, another contender for the title of the world’s tallest building, is due to be finished.